Adrift is a passable survival story, but the framing device and non-linear story structure kills the momentum the longer the movie goes on. Summary: Based on the true story of survival, a young couple’s chance encounter leads them first to love, and then on the adventure of a lifetime as they face one of the most catastrophic hurricanes in recorded history. The survival genre has come out with some real hits and some real misses, but they are usually pretty good overall. This time we’re combining the harrowing survival genre — think along the lines of All is Lost — with the kind of romance that is much more akin to young adult novels that teenagers read. That means we essentially have two movies that are smashed together. We see the whirlwind romance of Tami (Shailene Woodley) and Richard (Sam Claflin) and watch Tami struggle to survive in the wake of a hurricane. The story opens with Tami coming to after the accident, and throughout the film we see her and Richard meeting and falling in love intercut with the boating accident. The tonal dissonance between the actual survival story on the boat and the love story might have worked if the movie was told linearly. The slap in the face when we switch from lovely romance to needing to give yourself stitches for a head wound would be jarring, but it’s the type of jerk that could have worked. Instead Adrift peppers the love story and the survival story together. It kills any momentum when it comes to getting invested in the story of survival and makes the viewer resent going back and forth, even if Woodley and Claflin have great chemistry. Warning for spoilers, but this is based on a true story, so take of that as you will. 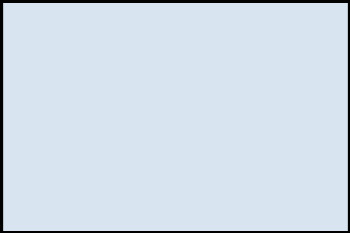 Toward the end of the movie, as the timeline for the survival and timeline of the romance moves forward until the accident, the movie peels back the curtain to reveal the little twist. 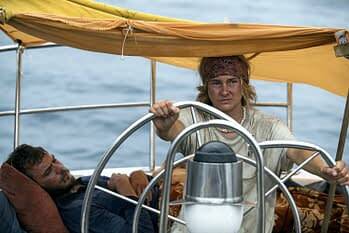 Early on in the movie we see Tami rescue Richard, but his leg and ribs are broken and he can barely move. Tami is remembering the boat accident and she says, “it’s time for me to let you go.” It turns out that Richard didn’t survive the accident and he has been a hallucination this entire time. She’s been alone and going more than a little out of her mind. We see the accident happen and Richard get thrown overboard. We see his body floating underwater and a pipe from the boat smash into his head, which likely killed him. The non-linear storytelling seems to lead up to this reveal as we finally see that Richard didn’t survive at all, though the opening shot of the movie does hint at this. Tami — the real Tami who survived this — does say that she spoke to Richard and hallucinated him while she was fighting for her life. In this adaption they try to turn his death into a twist when they could have made him a hallucination to begin with. It could have given us some poignant insight into her mental deterioration. It was twist for the sake of a twist when it wasn’t really needed. There was no reason we couldn’t have most of the movie following Tami on her own with Richard the hallucination popping in and out to talk to her. All is Lost had a singular character alone on a boat, and it was fantastic. There was no reason they couldn’t have done that here as well. 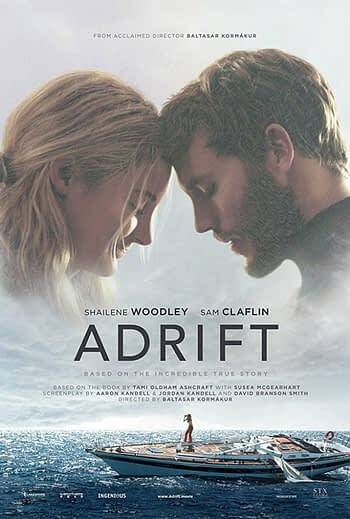 Adrift features some good performances by its two leads, mostly its leading lady, but the framing device and structure make the hour and 40 minutes feel much longer than it is. The tonal dissonance between the love story and the survival story could have worked if it was structured differently. As it is, this is a well-acted but forgettable entry into the survival genre.